Cauliflower, pumpkin and other staples of the autumn harvest are now in season. Think outside the (farm share) box with these creative recipes. If the hype around pumpkin spice lattes is any indication, we are all ready to take the plunge into fall food trends. Luckily a lot of them are a whole lot healthier than the sugar-loaded calorie bomb that has a special place in every sweater-lovers’ heart. What's on the menu? Root vegetables like turnips and sweet potatoes, winter squash and a new lineup of fruit to fill the bowl on your kitchen counter. Whether you’re cooking up a weeknight dinner for one, meal prepping lunch or serving a hungry crowd of football fans, use the super foods of the season as inspiration to infuse autumn flavor and nutrients into your meals. From pizza to rice to mashed "potatoes", cauliflower continues to be an increasingly popular ingredient for healthy home chefs. But beyond it's trendy appeal, the starchy vegetable offers up nutritional benefits that give it major staying power when it comes to fall produce picks. Cauliflower contains “vitamin C and folate, and like other members of the cabbage family, is rich in sulfur-containing compounds (glucosinolates) which act as antioxidants, and are anti- inflammatory,” says Bowerman, who is a fan of turning it into a low-carb rice substitute for a healthier fried rice. Simply pulse it in the food processor, then sauté in a little oil in a large skillet with a beaten egg, chopped leftover cooked veggies and leftover cooked meat, fish, shellfish or poultry (or tofu). 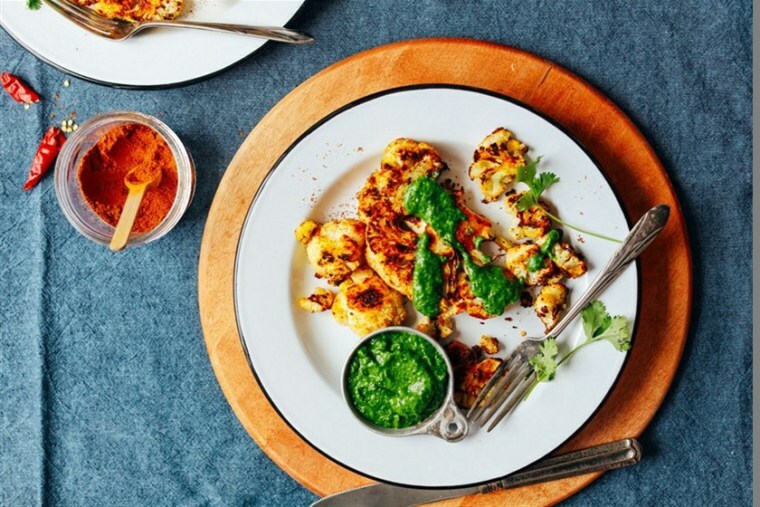 Recipe box: For a 30-minute weeknight meal, try this Cauliflower Steak seasoned with a smoky shawarma spices blend, roasted until tender with a crust, and served with chutney, from Minimalist Baker. Canned pumpkin may just be the best kept secret on the grocery store shelves. While it’s available all year long, we feel a re-invigorated love for the ingredient when fall rolls around. “A cup of sliced pumpkin has almost 200 percent of your daily value of vitamin A and is shock-full of vitamin C and potassium,” says Younkin. “As long as you aren't drinking it in syrup form in your latte, pumpkin is a healthy addition to any fall meal. A 1/2 cup of canned pumpkin delivers 3 grams of fiber and has just 5 grams of sugar and 50 calories. There isn't much you can't do with pumpkin — stir it into a soup, mix it into your morning oatmeal, or add it to a smoothie if it's an unseasonably warm day. Susan Bowerman, MS, RD, director and Worldwide Nutrition Education and Training for Herbalife, suggests using canned pumpkin in smoothies and as a nutritious topping for Greek yogurt. She stresses to make sure you are buying canned pumpkin and not pumpkin pie mix, which is packed with added sugar. Recipe box: Give breakfast an autumn twist with these Whole Wheat Pumpkin Pancakes. Top with sliced banana, a sprinkle of cinnamon and a drizzle of syrup. While apples contain vitamin C and phytonutrients, fiber is the shining start on the nutrition facts panel. “One medium apple has 4 grams of soluble fiber — the type that helps lower your cholesterol. Eating adequate fiber can also help with weight loss,” says Younkin. Recipe box: If you aren’t quite ready into give up your salads, give them a fall update by adding sliced apples. Add lots of fall flavor with this Green Salad with Apples, Cranberries and Pepitas recipe tossed in an apple cider vinaigrette. “Like pumpkin, butternut squash is also a very rich source of vitamin A,” says Bowerman. “[It’s] also a good source of potassium, magnesium and fiber." Recipe Box: Another football spread upgrade this Queso with Butternut Squash and Cauliflower, sneaks in veggies that add enough creaminess it calls for no milk or butter at all. Bowerman recommends adding slices to a sandwich with almond butter, or adding chopped pears when you braise short ribs or brisket: “They’ll fall apart and add a touch of sweetness and the fiber adds texture to the braising liquid,” she says. Recipe box: If you’re still stuck in a smoothie phase, swap in summer berries for pear, like in this recipe for a Pear Avocado Ginger Kale Smoothie. “I like to make potato pancakes with grated sweet potatoes instead of white potatoes because they’re so pretty. Top with eggs for a delicious brunch dish,” says Bowerman. Recipe box: For an easy brown bag lunch or dinner for one, turn to these Loaded Sweet Potatoes, packed with black beans and kale, and topped with a green goddess dressing. Recipe box: Give your favorite Mexican condiment — and trendy brunch order — a fall twist with this Avocado Toast with Pomegranate Salsa. Pair with whole-grain pita chips or use as a salad topper. A favorite of pasta-lovers-on-a-diet, spaghetti squash is a low-cal, versatile ingredient to begin incorporating into your diet in the fall. “A popular weight-loss food, spaghetti squash is a winter squash often used in place of spaghetti noodles. Just one cup of spaghetti squash has only 30 calories, while a cup of pasta has about 200,” says Younkin. “Mix with vegetables and a sauce of your choice for a healthy 'pasta' dish or try stuffing it with beans and veggies for a simple but fiber-full dinner." It has “some vitamin A and vitamin C, and is also a source of lutein and zeaxanthin, two carotenoid compounds that help protect eyesight against UV rays,” adds Bowerman, who recommends using it as a filling for veggie tacos. “Toss cooked spaghetti squash in a large skillet with chili powder, cumin, salt, pepper and lime juice until heated, then add some canned black beans (drained). Use to fill tacos and top with salsa and guacamole,” she says. Recipe box: Most people know the pasta-substitute hack, but you may be surprised to know if can sub in for meat in a pulled pork sandwich as well. Give it a try with these Pulled BBQ Spaghetti Squash Sliders. The root veggie is a good source of vitamin C, potassium, folate and fiber. Bowerman suggests making turnip mashed potatoes: “Steam or boil potatoes and turnips together until tender, then mash and season as you would mashed potatoes. Saves a lot of calories and it’s a great way to work more vegetables into your day. If you’re lucky enough to have the turnip greens, you can cut them very finely, sauté in a little olive oil, and serve alongside,” she says. Recipe box: Give the football spread a healthy twist by swapping out traditional potato salad with this Turnip No-Potato Salad recipe, which not only utilizes nutrient-packed turnips but also swaps out half of the mayo for protein-packed Greek yogurt.